For many, Labour Day weekend and the return of the school year signifies the end of summer. With fall just around the corner, its time to begin thinking about closing your pond for the winter season before temperatures begin to drop. If you’re new to the process, follow these steps to ensure a successful transition for your pond throughout the colder seasons. If your pond is small enough, it’s a good idea to use a pond net to catch falling leaves. Set-up the netting earlier in the fall season and simply roll the netting and collected leaves off the pond once you’re ready to close it down. If your pond is too large to use a pond cover, it’s a good idea to invest in a long handled net to scoop leaves and debris from the water. In both cases, be sure to remove submersed debris that has collected on the pond floor. Dying plant life can also be a source of debris. Prune dead aquatic plants to help remove excessive organic debris and prevent water quality problems by removing toxic gasses from plant life that would otherwise decompose in the water. Removing the pump, pond fountain and aerator from your pond helps extend the longevity of your products since cold-water conditions can damage and add strain to moving parts if left in the water. When removing the pump, fountain and pond aerator, take this opportunity to thoroughly inspect your equipment: examine power cables for nicks and damages, and ensure the motor turns freely. Power-wash all equipment before storing for the winter. 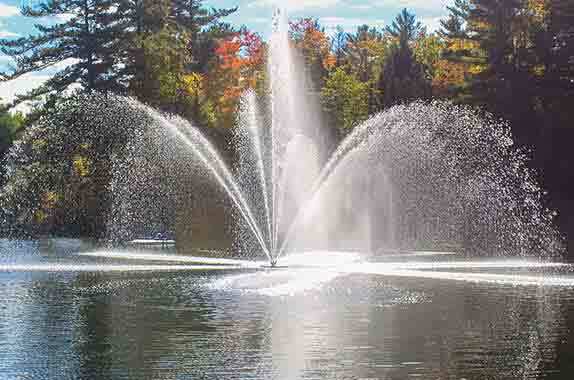 Store your pond pumps, fountains and aerators in a location where temperatures will not fall below freezing. It is also recommended to store motors in water (if submersible) as the motors are water cooled & water lubricated. Remove excess water from all plumbing to prevent pipes from bursting when water temperature drops below freezing. Remove and clean pond filters by rinsing with clean water before storing. Help your fish survive their winter slumber by using a pond de-icer. If your pond is allowed to completely freeze over, harmful gases such as ammonia and carbon monoxide will be trapped beneath the ice causing harm to your fish. A de-icer will keep an area of the pond ice-free during winter, allowing oxygen to enter and toxic gases to escape through the opening. A pond de-icer is an important tool to help ensure the survival of your fish throughout winter, so it’s a good idea to check over your de-icer before putting it into your pond for the winter season. Inspect your de-icer and power cable for any damage or potential problems, and be sure to plug it in outside of the pond to ensure everything is in working order. It’s also important to remember: never break any ice that formed on your pond. It can be very harmful to your fish, even fatal. Closing your pond for winter is an important step in maintaining proper pond health for those owners who experience ice-covered water. Choosing an appropriate time to close your pond will vary by climate, but it’s recommended to stop feeding your fish once the pond temperature drops below 50°F (10°C). By following these steps, you’re ensuring your pond and aquatic pond life will stay healthy and happy, and ready to greet you in the spring!